Dream Big! Never Give Up!Because dreams really do come true.Rudy became the inspiration for millions when a Hollywood film depicting his journey as a Notre Dame football player became one of the most influential sports movies ever made. 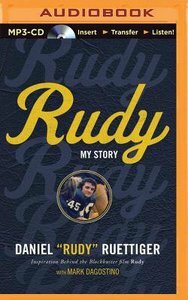 In Daniel "Rudy" Ruettiger's only autobiography, go behind the scenes to experience the heartache, triumph, and glory through Rudy's own eyes, and learn the details of the ten years it took to get the movie made.For the first time, the real Rudy shares his story of floundering through school with undiagnosed dyslexia and finding himself mixed up with a rough and rowdy crowd. "Football was my salvation in high school," Rudy believes, and while he dreamed of playing for Notre Dame he never believed he was smart enough to make it to that elite group of higher education.After high school, he worked at the local coal-fired power plant--feeling desolate and destined for a lower middle-class life stuck in Joliet, Illinois. It wasn't until the Vietnam War in 1969 that he headed to the Navy recruiting office and the trajectory of his life moved in a new direction. The discipline and hard work ethic that his parents had instilled in him growing up carried him through that experience, and he left believing, for the first time, that he was capable of great things.A poignant and high-energy storyteller, Rudy details failures and pitfalls along the way. He explains the persistence and determination it took to get accepted to Notre Dame, to suit up and play for twenty-seven glorious seconds, and to see the dream of his movie become a reality. Rudy is truly a real-life testament to the old adage that it is not how many times you get knocked down, but how many times you get up again. He will motivate you to discover your own dreams and to pursue them with an unrelenting faith that anything is possible.Rudy doesn't just represent a far-fetched Hollywood story that most people can never attain--its message is that anyone with a dream can make that dream a reality by being willing to put in the hard work and heart it takes to get there. About "Rudy: My Story (Unabridged, Mp3)"
Daniel "Rudy" Ruettiger is the subject of the blockbuster film Rudy and one of the most popular motivational speakers in the United States. His humble background and determination to pursue his dreams, no matter the challenge, has made him legendary and an inspiration to everyone from school children to businessmen and athletes, even presidents. He established the Rudy Foundation to help children around the world and the Rudy Awards for high school and university level athletes.